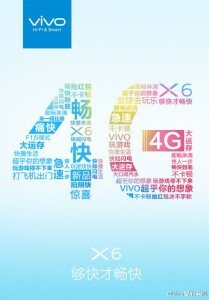 vivo continues its teaser campaign about the vivo X6, officially confirming the 4GB RAM spec and also 4G connectivity. The teaser animation shows that more apps can fit in 4GB RAM, boosting multitasking, but it says nothing about the most interesting rumored features of the X6. That would be the 1GB of dedicated video RAM, like discrete computer GPUs have. So far, smartphones shared their pool of RAM between the processor and the GPU. We'd also welcome official info on the chipset soon, rumored to be a 10-core MediaTek Helio X20. There's a not really official video showing the vivo X6 and against the iPhone 6s Plus. The Vivo launches apps that little bit quicker in this admittedly unscientific test. Also, the video was shot in the dark so that only the screens are visible, except for the very last second. It seems like the Vivo was wrapped around in duct tape to conceal its design.